Australian captain Ricky Ponting has said his team is prepared to take on the fierce Sri Lanka bowling attack in Saturday’s World Cup final. 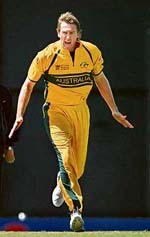 Australian fast bowler Glenn McGrath became the leading wicket-taker in a single World Cup after taking three dismissals yesterday in the seven-wicket semifinal victory over South Africa. The 37-year-old McGrath, who will retire at the end of the tournament, passed Sri Lankan seamer Chaminda Vaas’ record of 23 when he took the second of his three wickets. Australia took on Sri Lanka in the World Cup final at the Gaddafi Stadium in Lahore on March 17, 1996. The Lankans won by seven wickets, with Aravinda de Silva bagging the man-of-the-match award. That Australia and Sri Lanka will be playing the World Cup final is not a coincidence. They have been the top two sides of the competition, having been served wonderfully by splendid batting, incisive bowling and brilliant fielding. Struggling pace bowler Dilhara Fernando will be axed from Sri Lanka’s team for Saturday’s World Cup final after his disastrous performance in the semifinal win over New Zealand. Fernando was warned twice for running on the pitch during the 81-run win over the Black Caps at Sabina Park on Tuesday while his five overs cost 45 runs. Sri Lanka’s World Cup winning captain Arjuna Ranatunga says the present team’s lack of depth in batting is a worrying factor ahead of the World Cup final against Australia. 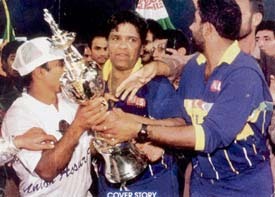 Arjuna Ranatunga led Sri Lanka to victory in the 1996 World Cup. Having recently retired from one-day cricket, Inzamam-ul Haq’s future in Pakistan’s Test team now looks in jeopardy with a top PCB official indicating that he would be dropped for the home series against South Africa. Ian Chappell, who received considerable flak in India when he suggested recently that Sachin Tendulkar should retire, has said that the Indian master batsman was now playing the game for “wrong reasons”. Gaurav Ghei produced a sensational back nine with five birdies on way to carding a seven-under 65 that put him on top of the leaderboard at the end of the first day of the inaugural $500,000 Pine Valley Beijing Open. A week after losing its bid to stage the 2014 Asian Games, India today cried foul and accused South Koreans of using unethical means to get the games awarded to the city of Incheon. Commonwealth Games gold medallist Geeta Rani today added to India’s medal tally by winning two bronze medals at the 19th Asian Women’s Weightlifting Championship at Tai’an city in China. Sri Lanka had tactically rested key bowlers Muttiah Muralitharan and Chaminda Vaas, while Lasith Malinga was out with an injury, against Australia in the Super Eight encounter. Ponting said his team had knowledge about Lankan bowlers and was ready to face their well-disguised armoury. “We know Murali will do what he does. Lasith Malinga is bowling well and Vaas is a good bowler with the new ball but we have a couple of days to look at them and prepare,” Ponting said. Ponting, whose team is just one match away from the unprecedented feat of claiming the hat-trick of World Cup titles, said Australia were confident after their comprehensive wins, including one against Sri Lanka. “There’s no doubt that Sri Lanka are a good team, but we are very confident after what we have done in the past seven weeks. Winning games with big margins gives us a lot of confidence,” Ponting said after his team thrashed South Africa by seven wickets in the semifinal yesterday. “I think we executed our game plan very well the last time we played them. They had their full batting line-up and we bowled them out,” he added. Ponting said his team was aware of the challenges it would be facing from of Sri Lankan bowling attack and would be prepared for them. Ponting sounded excited than jittery about the Saturday’s showdown, which would be a repeat of the 1996 final when the islanders beat Australia in Lahore. “They played some very good cricket on Tuesday but I really like the match-up,” he said. Ponting said the team was upbeat after the way it fashioned South Africa’s collapse in yesterday’s match when Australia had reduced the opposition to 27-5 at one stage. “We are not saying we are unbeatable. We certainly can be beaten if we don’t do things well,” he said. “No doubt it was our best performance of the tournament today and getting them out for that total was definitely our best. Australia are now unbeaten in 28 World Cup matches, bowling out all the teams, except Bangladesh as the match was reduced to 20 overs. Departing coach John Buchanan has tipped all-rounder Michael Clarke to be the next skipper of Australia, provided he takes the right steps in the right direction from now onwards. The 54-year-old coach said Clarke, nicknamed Pup, could be top dog once Ponting’s time is up. “I see him growing as a person,” Buchanan, who will quit his job after the World Cup final against Sri Lanka after eight years at the helm, told The Australian. Buchanan said it was important for Clarke to get along with the right people. Twentysix-year-old Clarke, who made his Test debut against India in Bangalore almost three years ago, has enough time to be ready for the most coveted role in Australian sport. Especially the way Ponting (32) is going he should play for four years at least. By then Clarke should have played about 70 Tests and 200 one-day internationals. Australian fast bowler Glenn McGrath became the leading wicket-taker in a single World Cup after taking three dismissals yesterday in the seven-wicket semifinal victory over South Africa. The 37-year-old McGrath, who will retire at the end of the tournament, passed Sri Lankan seamer Chaminda Vaas’ record of 23 when he took the second of his three wickets. He was declared the man of the match. Despite his success in the Caribbean, McGrath insisted he was still retiring after Saturday’s final, as he had announced in advance. McGrath’s 25 wickets in this tournament have come at an average of 13.04 runs each from 10 games. Vaas had set the record at the 2003 tournament in South Africa. McGrath took three for 18 in eight overs at the Beausejour Stadium, playing a crucial role in dismissing South Africa for 149 and reserving Australia’s place in the final against Sri Lanka in Barbados. “I always love playing South Africa, they’re up for a good battle. They are quite an aggressive side,” he said. “There’s just one side I enjoy less losing against than South Africa,” he said in a clear reference to traditional enemy England. McGrath, fondly known as Pigeon, retired from Test cricket earlier this year by taking the last England wicket of a triumphant 5-0 sweep that saw Australia reclaim the Ashes they lost two years earlier in England. The tall New South Wales bowler has now taken 70 wickets in World Cups since 1996. He is now 15 ahead of retired Pakistani quick Wasim Akram. Sri Lankan spinner Muttiah Muralitharan briefly overtook McGrath on Tuesday with four wickets in the victory over New Zealand. Yesterday, McGrath stuck to the simple routine that has made him one of the world’s leading bowlers since he made his debut for Australia in 1993, finding perfect line and length in the batsmen’s “corridor of uncertainty” outside the off-stump. Jacques Kallis and Ashwell Prince fell to two such deliveries, while wicketkeeper Mark Boucher was caught at first slip from a ball that would probably have been called as a wide. McGrath agreed to stay on to help Australia’s bid to win an unprecedented third successive World Cup and said the legacy of Australian pace bowling was safe. “We have plenty of fast-bowling options. Look at the four bowlers here, we have different kinds of bowlers who complement each other,” he said. “There are others following in my boots.” McGrath said, adding that batsmen seemed to be anxious to face him rather than the others. Australia took on Sri Lanka in the World Cup final at the Gaddafi Stadium in Lahore on March 17, 1996. The Lankans won by seven wickets, with Aravinda de Silva bagging the man-of-the-match award. Muttiah Muralitharan, Sanath Jayasuriya, Chaminda Vaas, Ricky Ponting and Glenn McGrath are the five survivors of that summit clash. FoW: 1-36, 2-137, 3-152, 4-156, 5-170, 6-202, 7-205. Bowling: Wickramasinghe 7-0-38-0, Vaas 6-1-30-1, Muralitharan 10-0-31-1, Dharmasena 10-0-47-1, Jayasuriya 8-0-43-1, De Silva 9-0-42-3. Bowling: McGrath 8.2-1-28-0, Fleming 6-0-43-1, Warne 10-0-58-0, Reiffel 10-0-49-1, Mark Waugh 6-0-35-0, Steve Waugh 3-0-15-0, Bevan 3-0-12-0. I always felt Sri Lanka had New Zealand’s measure. The Lankans are at home on typical one-day wickets, and the one at Kingston belonged to that category. But that should not take anything from the performance of Mahela Jayawardene’s side, which was clinical and professional. As is the case with all great sides, the Sri Lankan players have distinguished themselves in difficult situations. Their talent and commitment cannot be doubted. Coach Tom Moody’s influence should also be acknowledged. The captain himself led from the front with a magnificent hundred. I don’t think he has played a more important knock in his career. He ensured that his side ended with at least 30 runs more than what could be termed as a good score in the conditions. Sri Lanka could have struggled after Sanath Jayasuriya left early, but the captain saw to it that they didn’t. The Kiwis were not helped by an off-day for Shane Bond. He couldn’t make the new ball count, and that made a huge difference. New Zealand had their task cut out when the Lankans finished with 289. Vaas, Malinga, Fernando and Muralitharan were not going to lay the red carpet for them. When Murali bowls, he always poses problems, and when he has runs to bowl with, he is positively lethal. He has tormented the Kiwis on numerous occasions in the past, and the semifinal was no exception. The second semifinal was an anti-climax. The pitch reports suggested that South Africa had levelled the contest by winning the toss and opting to bat first. The wicket looked full of runs and I guess everybody expected a thriller of an encounter. Well, I am not too sure what happens to the South Africans when they play the Australians in big games. Not for the first time, they displayed a mental fragility, and paid the price. Why Graeme Smith came dancing down the wicket, only he will be able to explain. I also cannot comprehend why a champion batsman like Jacques Kallis changed his approach. South Africa needed him to bat right through, and had he done so, they would have most definitely finished with a competitive score. But he made room to play Glenn McGrath of all bowlers, and missed. Those two early wickets forced South Africa onto the back foot, and they were never in the game thereafter. Their tactics were flawed, to say the least. I feel they need to get together and rethink their methods of preparing for critical games. Struggling pace bowler Dilhara Fernando will be axed from Sri Lanka’s team for Saturday’s World Cup final after his disastrous performance in the semifinal win over New Zealand. Fernando was warned twice for running on the pitch during the 81-run win over the Black Caps at Sabina Park on Tuesday while his five overs cost 45 runs. Sri Lanka’s chief selector Asantha de Mel told BBC that they were not happy with Fernando’s form and that fellow seamer Farveez Maharoof was likely to get the nod. Maharoof was considered unlucky not to make the semifinal after he had taken 4-25 in Sri Lanka’s last Super Eight game against Ireland. De Mel also confirmed that Upul Tharanga would continue to open ahead of former skipper Marvan Atapattu. If Atapattu doesn’t play, it will be the second time he has sat out an entire World Cup tournament. The same fate befell him when Sri Lanka won the title in 1996. Maharoof was named man of the match against Ireland last week where he took four wickets, including three in an over, as well as pulling off a stunning run-out. Ironically, Maharoof, a former captain of his country’s under-19 side, was only playing in that match in Grenada because Fernando had an ankle injury. “I got injured earlier in the tournament against Bangladesh but I just kept working hard in the nets,” said Maharoof. “This is my first World Cup and it is something I have been looking forward to ever since I became professional three years ago. Ranatunga said the team was heavily dependent on the top order and did not bat too deep down. “I’m still a bit worried about the batting, though not so about the bowling,” said Ranatunga as he indulgently looked at Mahela Jayawardene’s side looking to emulate his 1996 feat. The former batsman praised veteran Sanath Jayasuriya, who had shown commitment in terms of performance as well as his fitness and still going strong, even though he is nearing the mark of 400 matches in one-day internationals. “Jayasuriya has really shown commitment. His batting has improved and he is matching youngsters in fitness. But the batting is heavily dependent on the top order,” he said. In the bowling department, Ranatunga rated spin wizard Muttiah Muralitharan and paceman Chaminda Vaas as the lynchpins of Sri Lanka’s attack but said the edge to the attack came from the unusual bowling style of Lasith Malinga. “He is a sharpshooter who can take wickets with both the new and the old ball. He has really added edge to the bowling attack,” he said. “They are playing very good cricket and I think they can go all the way,” Ranatunga said. He was, in particular, happy with the form of Jayawardene, who played a captain’s knock on Tuesday to steer his side to the final. Recalling the day when he persuaded a young, reluctant Jayawardene to come back to the game, he said: “I saw him playing school cricket and I knew he was blessed with talent. “He lost his brother to a brain tumour when he was young and he was not really interested in playing cricket. “But we dragged him in. He was very close to his brother. He said he (his brother) was a better cricketer than he was but I didn’t see him play. I invited Mahela to come and play for my club (the Sinhalese Sports Club in Colombo). Ranatunga gave Jayawardene his first break in international cricket when he included him in the playing eleven in a Test against India in Colombo in 1997. Jayawardene did not disappoint him with a sweetly timed half-century, though it was the record total of 952 which dominated the memory. The cricket board official said it had almost been decided in principle not to retain Inzamam in Pakistan’s Test squad for the September-October series. “The people forming the PCB think-tank are more or less convinced that Inzamam should not be a part of Pakistan’s Test squad,” he was quoted as saying by the The News today. The 37-year-old player, who announced his retirement from ODIs following the team’s World Cup fiasco, had said he was still good enough to play in the longer version of the game but top PCB officials do not seem to be agreeing with him. Players should be in the game to win but Tendulkar is now playing for wrong reasons, the former Australian captain said on Sony Max TV during the coverage of the second semifinal of the World Cup between Australia and South Africa last night. Answering questions about when great players should retire, the blunt Australian said cricketers should call it a day when fans ask, “why” and not “when”. He pointed out that another great batsman of this era Brian Lara had announced his retirement. So had two of Australia’s greatest bowlers Shane Warne and Glenn McGrath, both of whom had still a great deal of cricket left in them. In Chappell’s view, great batsmen should not be seen struggling to make runs or great bowlers struggling to take wickets in the autumn of their career. In a newspaper column last month, Chappell had written that during the last three or four years, Tendulkar had been a shadow of his former self. Ghei led by a stroke over Thai rookie Panuwat Muenlek (66), while the mercurial John Daly (67) was in lone third place at the Pine Valley Golf Resort and Country Club. Ghei’s performance was the highlight of the day with some fine hitting and impeccable putting. Ghei, who endured an 11-year wait between his two previous wins on the Asian Tour, won the Mercuries Taiwan Masters last year, more than a decade after his win at Gadgil Western Masters in 1995. The next best Indian on show was his fellow Delhi Golf Club player, Vivek Bhandari (70) who was tied 19th. Gurbaaz Mann (72) was tied 50th, while three others — Digvijay Singh, SSP Chowrasia and Harmeet Kahlon — shot 73 each and were tied 63rd. Bhandari had five bridies and three bogeys, while Mann had five each of birdies and bogeys. The Koreans offered “carrots” to the 45-member Olympic Council of Asia (OCA) which awarded the games to Incheon after a two-day meeting in Kuwait where India and Korea lobbied hard. A bitter Indian Olympic Association (IOA) President Suresh Kalmadi had later blamed Union Sports Minister Mani Shankar Aiyar’s opposition to the staging of the Games for the loss to Korea. IOA General Secretary Randhir Singh gave additional reasons for Korea’s victory, including its announcement of $20 million offer to the OCA for training and equipment of athletes of participating nations. “While Korea announced that the money will be given to the OCA which in turn would distribute it among National Olympic Councils (NOCs) as per its discretion, it was like offering a carrot to the OCA,” he told PTI here. The Indian delegation, he said, had all the information about “opposition tactics” but it was not possible to match them even during the presentation. During their presentation, the Koreans waved mineral water bottles served to the delegates at the meeting and reminded them that the water being served here was also from Korea". According to Randhir, the Koreans missed no opportunity to lobby. Korean representatives received guests at an OCA dinner on the eve of the presentations. “Yes, the Koreans looked like the hosts of the dinner. It was not ethical,” he said.